What do traditional devices like TVs, PCs and DVDs have in common with in-demand Bluetooth gadget? Both can connect to the sound bar for unparalleled convenience and usability. 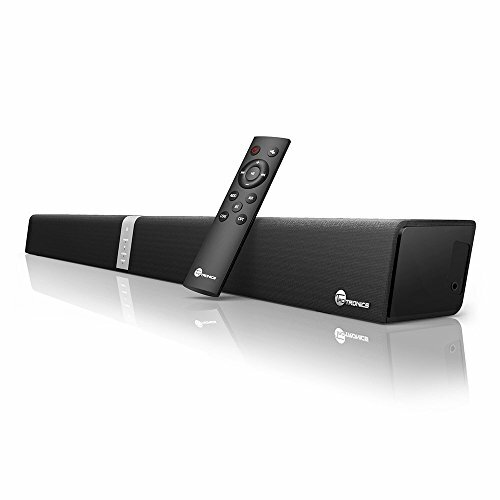 The sound bar allows wired connections included LINE IN, Optical, Coaxial, and RCA IN so practically every device can connect; while your favorite smartphones, tablets, and other Bluetooth devices have the option to connect wirelessly. Misplaced the remote? Never fear because the sound bar is fully operational from the unit itself. Adorning the side is a high grade metal control unit that responds to the slightest touch allowing you to adjust the volume, select tracks, or play and pause music. And when you do find the remote, it can also do the same. As versatile as it powerful, the TaoTronics sound bar can be placed directly under your television or mounted to the accompanying wall to reduce clutter and save space. No matter how you choose to place it, rich clear sound will reach all around the room. A sound bar adds a modern and exciting touch to any home, elevating your standard living room into a personal theatre system so you do not need to watch a film anywhere else. Sitting low and stretching long, the sound bar uses tough ABS plastic and is covered by a soft touch cloth ensuring you have great sound for years to come. A MODERN LOOK: Constructed with robust material to last years, the design suits any home adding a modern and high tech touch.